Every year the team at Granit has a summer party. 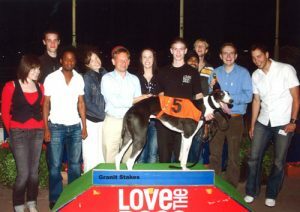 We decided to try something a little different for summer 2008 and so it was that Caroline, our Social Secretary, put her thinking cap on and decided to organise a night at the dogs. It was a truly enjoyable evening, although more for some than others. At least one member of the team managed not to pick a single winner all evening, while others cleaned up. Such is the nature of the dogs. We’re already looking forward to the Christmas party, which should be as spectacular as ever.